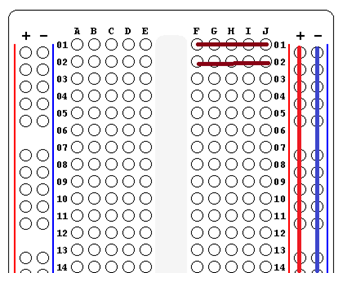 Your first program is just to test that the circuit is connected correctly. In order to turn on an LED, we use a digital write block and write a HIGH signal by choosing to write a 1. To turn the LEDs off, we digitally write a 0 to the pin that the LED is connected to. Speak to your teacher if you don't see all of the LEDs flashing on and off. Or, have a go at correcting the circuit yourself, using the photograph and explanations to help you. Write a program to turn the LEDs on one at a time. There should be a 1 second pause between each LED turning on. Add your blocks to ON START so that the lights just turn on one by one. Make it so that the LEDs come on when you press the A button and go off when you press the B button. Also use an ON START block in your program and turn all of the LEDs off when the program first starts. Pressing the A button turns 2 of the LEDs on and turns the other 2 off. Pressing the B button does the same but with 2 different LEDs. Turn all of the LEDs off. 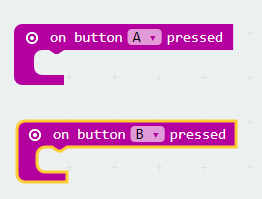 Use an IF block (with 2 ELSE Ifs, 1 ELSE) to turn one of the LEDs back on at random. Using analog writeUsing analog write blocks instead of digital write, allows you to set the brightness of the LED. You can write any value from 0 to 1023. 1023 is full brightness. Some of the lower values here will not be bright enough to be seen. The following program uses a FOR loop to fade in the first LED. Adapt this program by adding the 3 analog write blocks required to fade in the other 3 LEDs. 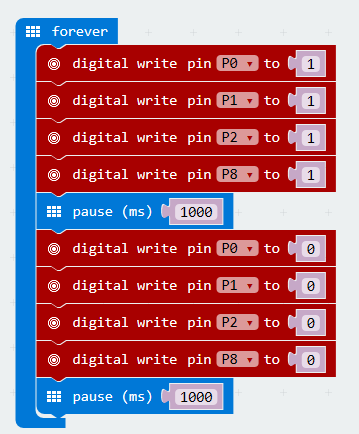 If you take the code from Task 6 and you write 1023 - index, you can make the LEDs fade out. Try that. 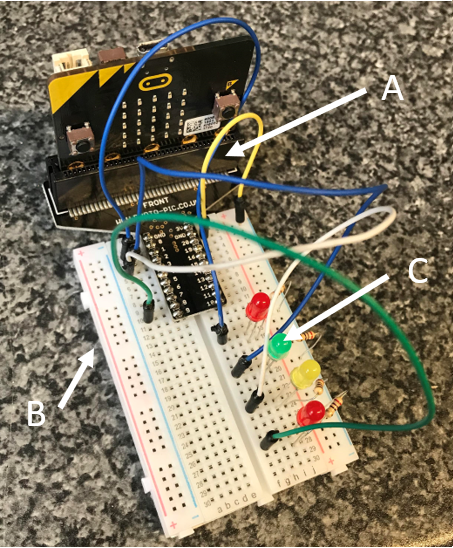 Experiment with a program that allows you control the brightness of the LEDs using the two micro:bit buttons. I recommend using a variable and setting it to 0 when the program starts (ON START). When the A button is pressed, add 100 to the variable. When the B button is pressed, subtract 100 from the variable (CHANGE ... BY). Add a FOREVER block. If the brightness variable is greater than 1000, set it to 1000. If it is less than 0, set it to 0. Then use analog write blocks to write that variable to the LED pins.